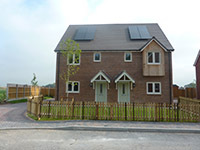 Pickstock Construction has completed work on an affordable housing site named Wingate Way at Park Hall just outside Oswestry. The site has been built on behalf of Meres and Moses Housing Association, part of the Shropshire Housing Group. The new site offers 18 quality, affordable homes to local people wanting to rent or buy a property in the area. Wingate Way is a low density site comprising of two and three bed semi-detached houses and two bed bungalows. 14 homes will be rented out with affordable rates by Meres & Mosses and four homes will be available to buy on a shared ownership basis. The site is perfectly located, situated on a quiet road and backing onto agricultural land, it is perfect for families and the elderly. Julia Brion, Developments Manager for Shropshire Housing Association was one of the representatives at Park Hall to receive the hand over. Shropshire Housing Group has over 4,500 affordable homes in and around Shropshire. Wingate Way has been funded by the Department for Communities and Local Government who have pledged to invest £4.5bn through their Affordable Homes Programme.